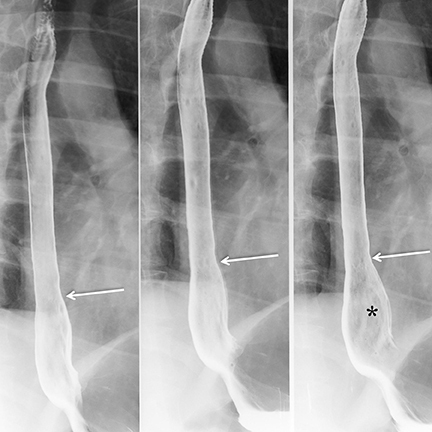 Despite the advances in cross-sectional imaging, the double-contrast barium swallow examination (BSE) remains the best imaging study for evaluating patients with gastroesophageal reflux disease (GERD) and dysphagia. The purpose of the examination is not simply to document the presence or absence of gastroesophageal reflux (GER), but also to detect its complications, such as erosive esophagitis, stricture (both transverse and longitudinal), hiatal hernia, Barrett’s esophagus, adenocarcinoma, and dysmotility. These complications have important implications for the patient, the gastroenterologist, and the surgeon.GER is a common condition in which gastric contents reflux in a retrograde manner superiorly through the lower esophageal sphincter(LES) into the esophagus and possibly the oropharynx. While many people experience some degree of normal reflux of gastric acid contents, such episodes are generally considered “physiologic,” as they are asymptomatic and the refluxate rapidly clears.1 GERD is a clinical condition in which the symptoms of GER are severe enough to affect a patient’s quality of life or cause damage to the esophagus.1 It is typically a chronic condition that requires lifestyle modifications, medication, or possibly surgery.Understanding this entity is of paramount importance to radiologists, as we can aid recognition of symptoms, evaluate with a BSE, identify complications, and guide surgical evaluation. The goal of this article is to outline the routine BSE in the evaluation of GERD as we perform it at our institution. 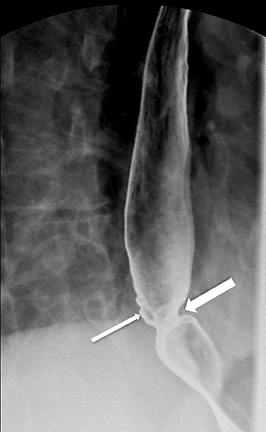 The BSE begins with fluoroscopic survey of the mediastinum and abdomen for the presence of an air-fluid column in the esophagus and the presence or absence of a gastric bubble, as symptoms of GERD can overlap those of an undiagnosed motility disorder, such as achalasiaor scleroderma. The patient takes a single swallow of low-density barium to ensure no delay in emptying or the presence of an obstructing mass. 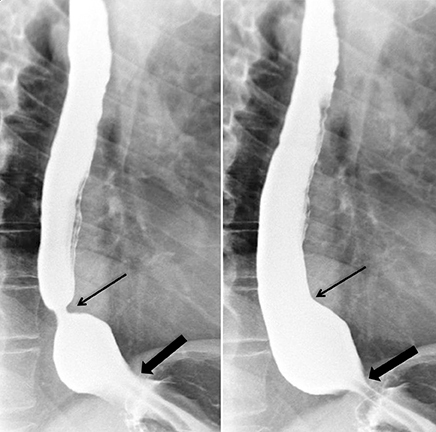 If emptying is impaired and achalasia is suspected, a 1-, 2- and 5-minute timed swallowing study is performed, which includes images of the GEJ and the superior aspect of the air-fluid column.2 If there is no emptying delay, a standard double-contrast examination is performed; it includes standing double-contrast images, prone oblique, distended, single-contrast images, fluoroscopic recording of motility, and provocative maneuvers for reflux. The final step of the barium swallow is to administer a 12.5-mm barium tablet, imperative in any patient with complaint of dysphagia whose symptoms were not explained by findings on the routine study. A tablet can also be useful in determining significance of a stricture. Tight strictures do not need a tablet, but the tablet is not contraindicated, since it eventually completely dissolves. The double-contrast portion of the examination is performed with the patient in the upright LPO position. A packet of EZ Gas II dissolved in 10 mL of water is given to the patient to drink quickly, followed by 2 ounces of high-density barium. Three views of the air-distended thoracic esophagus are immediately obtained, with the first image including the upper-thoracic esophagus and two of the images including the lower-esophageal sphincter while the esophagus is fully distended. High-quality air-contrast views of the esophagus provide the detail needed for diagnosing mucosal pathology, such as erosive esophagitis. 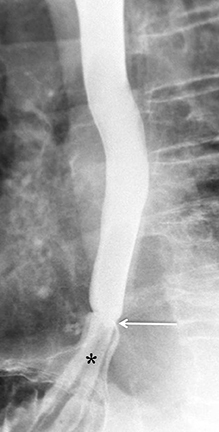 Esophagitis is defined as defects in esophageal mucosa caused by damage to the epithelial cells by the caustic effects of pepsin.4 Radiographic findings of esophagitis are seen in the distal one-third to one-half of the esophagus and can range depending on the level of severity.Findings include granularity of the mucosa (secondary to edema and inflammation of the mucosa), thickened folds (secondary to edema and inflammation of the submucosa), erosions, ulcerations, and stricture.4 Patients with chronic reflux may have an inflammatory esophagogastric polyp, which is a single enlarged fold arising from the gastric cardia and extending superiorly into the distal esophagus as a polypoid protuberance.9 It does not represent true neoplasia as “polyp” implies. Erosions due to GER, typically in the distal esophagus, may be solitary or multiple. 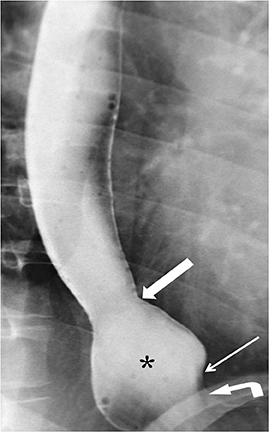 When a solitary erosion is identified, the most common location is the posterior wall of the distal esophagus.10 Erosions can have punctate, linear or stellate configuration and often have an associated surrounding halo of mucosal edema or radiating folds (Figure 3).11 Barrett’s esophagus is a metaplastic, premaliginant process in the mid or distal esophagus in which the squamous epithelium is replaced by columnar epithelium.12 This occurs secondary to mucosal healing in an environment of continued reflux. 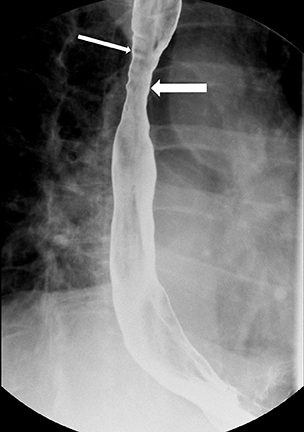 The classic radiographic appearance is a stricture in the mid esophagus accompanied by a mucosal reticular pattern, although the latter is rarely seen (Figures 4 and 5).12,13 Other findings, such as a widened hiatus, shortened esophagus, spontaneous reflux, esophagitis, stricture, and a hiatal hernia are often present in Barrett’s esophagus but nonspecific (Figures 6 and 7).14 However, if the majority of these findings are seen, the presence of Barrett’s esophagus should be entertained. Esophageal adenocarcinoma is the most dreaded complication of GERD and is now the most common esophageal cancer in the UnitedStates. The transition from Barrett’s esophagus to adenocarcinoma progresses from low-grade to high-grade dysplasia, requiring endoscopic surveillance for these patients. In a recent review of 11,028 patients with Barrett’s esophagus in a follow-up period of 17 years, the incidence of adenocarcinoma was 2.9 cases per 1000 person-years with an absolute annual risk of 0.12%.15 Malignant strictures are more likely to have abrupt and shelf- like margins and irregular or ulcerated mucosal surface (Figure 8).16 Hiatal hernias are seen at barium swallow examination in >90% of patients with peptic strictures.16 When a stricture is detected in the absence of a hiatal hernia, the possibility of the malignant stricture should be considered. GER can result in abnormal esophageal motility characterized by weakened primary esophageal peristalsis.17 Unlike nonspecific dysmotility, GERD dysmotility does not typically demonstrate tertiary contractions.18 The motility portion of the examination is performed with the patientin the “gastrointestinal” or right anterior prone oblique position. This phase must be done with the patient in the horizontal position to eliminate the effects of gravity. The patient receives a cup of low-density barium and takes discrete swallows while being recorded. A minimum of 3separate swallows should be viewed of the entire esophagus from the oropharynx to the GEJ, following the peristaltic tail. Some recommend fluoroscopy of 5 complete swallows to exclude intermittent dysmotility.19 This is then followed by having the patient take 3 additional swallows while focusing on the GEJ. The radiologist should assess the amplitude and velocity of primary peristalsis as well as the presence or absence of lower esophageal dysfunction. In the normal swallow, the primary peristaltic wave should rapidly and consistently progress distally to the GEJ and completely clear the esophagus. Secondary peristalsis is intermittent and follows the primary contraction, and propels any remaining bolus from the esophagus.It is spontaneously initiated by luminal distention and is a normal clearing wave. Tertiary contractions are nonperistaltic contractions and always considered abnormal. The presence and type of motility disorder is crucial information since patients with GERD may have overlapping symptoms with those patients with achalasia, scleroderma, or diffuse esophageal spasm. Up to 50% of patients with GERD will have motility disorders (“nonspecific motility disorder”) where there is diminished primary esophageal peristalsis.4 This type of motility disorder will generally improve following anti-reflux surgery.20, 21 However, in patients with achalasia, scleroderma or diffuse esophageal spasm, there is no improvement in their motility following surgery. In fact, symptoms may worsen. The single-contrast portion of the BSE is also performed with the patient in the prone right anterior oblique position. 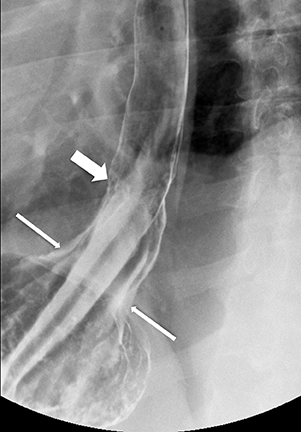 The patient is instructed to continuously swallow low-density barium in order to maximally distend the esophagus while spot radiographs are obtained. 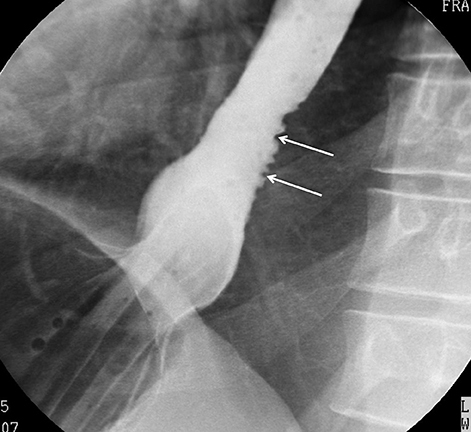 Stricture may form as a result of chronic esophagitis and is best delineated on the single-contrast portion of the exam (Figure 9), which optimizes the distension of the esophagus.22 BSE has been found to have a sensitivity exceeding 95% for the detection of stricture.23 Administering a barium tablet is helpful for demonstrating a stricture that might otherwise be missed and should be routinely performed with any patient complaining of dysphagia, particularly if the etiology for dysphagia is not discovered during fluoroscopy. Identifying the GEJ is important to accurately diagnose a hiatal hernia. Valsalva or inspiration while lying prone can reveal an occult hernia. There are four types of hiatal hernias. Type I (sliding) hernia is the most common, and the GEJ migrates superiorly through the hiatus.In a type II (paraesophageal) hernia, the gastric fundus herniates superiorly with a normally positioned GEJ. A type III (mixed) hernia is a combination of type I and II with the GEJ and a portion of the stomach hernia above the diaphragm. In a type IV hernia, the entire stomach herniates into the thorax with organoaxial rotation.4,6 Colon may also accompany the stomach in this type of hernia. It is important to determine if the hernia is present in an upright position; i.e., is it reducible? If not, one should suspect a short esophagus. The identification of a shortened esophagus is critical. 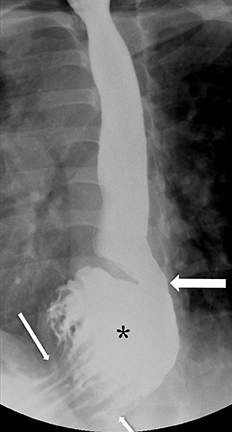 In addition to lack of reducibility, evidence of a short esophagus includes a hiatal hernia 5 cm or greater, ulcerative esophagitis, presence of a stricture or a type III hernia.4,27 Identifying a shortened esophagus is of upmost importance as it can lead to adverse surgical outcomes if not properly diagnosed.4 An esophageal lengthening procedure, such as a Collis gastroplasty, is essential for successful antireflux operations in these patients. The BSE can identify the presence and extent of reflux. During the exam, care should be taken to recognize spontaneous reflux. Reflux can be provoked by having the patient assume various positions. Instruct the patient to lie in the supine or LPO position to allow barium to pool in the gastric fundus. As the patient rolls toward the right lateral position, assess for reflux. If none is seen, maneuvers such as coughing,Valsalva, or the water siphon test can increase the sensitivity for gastroesophageal reflux. There is controversy concerning provocative maneuvers, specifically the water siphon test. While these maneuvers increase the sensitivity for GER, they result in lower specificity.28 Studies have shown that GER is observed at fluoroscopy in only 35% of patients with symptoms of GER, and spontaneous GER may be demonstrated in 40% of asymptomatic volunteers.29,30 Performing the water siphon test in a reproducible, controlled fashion helps mitigate against lowering specificity. Also, small “wisps” of refluxate demonstrated with the water siphon test should be ignored, as they are seen in many patients. The degree of esophageal injury depends on the frequency of reflux, the degree of reflux, and the efficacy of esophageal clearance of the refluxate. If reflux does occur, its superior extent and the time required for clearance is reported. 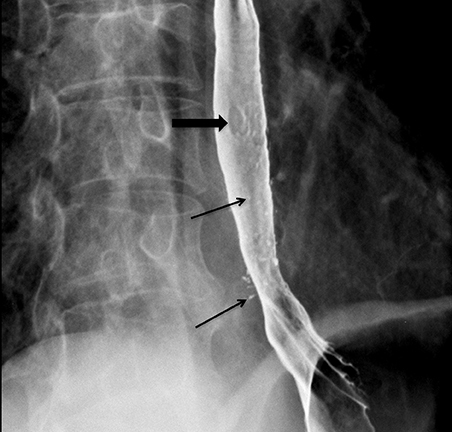 The major purpose of the barium study is not to establish the presence or absence of GER, but rather to detect the sequelae of reflux and to identify patients at risk for Barrett’s esophagus. GERD remains one of the most common diseases encountered by physicians, and radiologists can play an important role in diagnosing its complications The well-performed double-contrast BSE provides a relatively quick and inexpensive means of diagnosis. Kahrilas PJ. GERD pathogenesis, pathophysiology, and clinical manifestations. Cleve Clin J Med. 2003;70 Suppl 5:S4-19. de Oliveira JM, Birgisson S, Doinoff C, et al. Timed barium swallow: a simple technique for evaluating esophageal emptying in patients with achalasia. AJR Am J Roentgenol. 1997;169:473-479. Hyun JJ, Bak YT. Clinical significance of hiatal hernia. Gut Liver. 2011;5:267-2277. Canon CL, Morgan DE, Einstein DM, et al. Surgical approach to gastroesophageal reflux disease: what the radiologist needs to know. Radiographics. 2005;25:1485-1499. Lin S, Brasseur JG, Pouderoux P, Kahrilas PJ. The phrenic ampulla: distal esophagus or potential hiatal hernia? Am J Physiol. 1995;268(2 Pt 1):G320-327. Kahrilas PJ, Kim HC, Pandolfino JE. Approaches to the diagnosis and grading of hiatal hernia. Best Pract Res Clin Gastroenterol. 2008;22:601-616. Edmundowicz SA, Clouse RE. Shortening of the esophagus in response to swallowing. Am J Physiol. 1991;260(3 Pt 1):G512-6. Ott DJ, Gelfand DW, Wu WC, Castell DO. Esophagogastric region and its rings. AJR Am J Roentgenol. 1984;142:281-287. Bleshman MH, Banner MP, Johnson RC, DeFord JW. The inflammatory esophagogastric polyp and fold. Radiology. 1978;128:589-593. 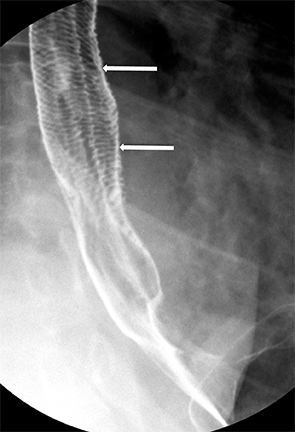 Hu C, Levine MS, Laufer I. Solitary ulcers in reflux esophagitis: radiographic findings. Abdom Imaging. 1997;22:5-7. MS L. Gastroesophageal reflux disease. In: Gore R, Levine M, eds. Textbook of Gastrointestinal Radiology. 2nd ed. Philadelphia, PA: Saunders; 2000:329-349. Levine MS, Kressel HY, Caroline DF, et al. Barrett’s esophagus: reticular pattern of the mucosa. Radiology. 1983;147:663-667. Chen MY, Frederick MG. Barrett’s esophagus and adenocarcinoma. Radiol Clin North Am. 1994;32:1167-1181. Yamamoto AJ, Levine MS, Katzka DA, et al. 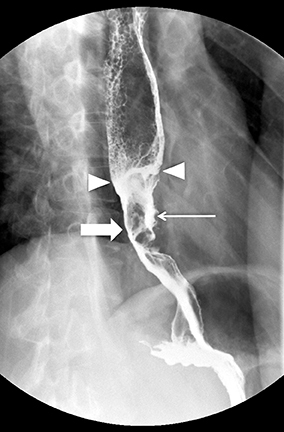 Short-segment Barrett’s esophagus: findings on double-contrast esophagography in 20 patients. AJR Am J Roentgenol. 2001;176:1173-1178. Hvid-Jensen F, Pedersen L, Drewes AM, et al. Incidence of adenocarcinoma among patients with Barrett’s esophagus. N Engl J Med. 2011;365:1375-1383. Gupta S, Levine MS, Rubesin SE, et al. Usefulness of barium studies for differentiating benign and malignant strictures of the esophagus. AJR Am J Roentgenol. 2003;180:737-744. Diener U, Patti MG, Molena D, et al. Esophageal dysmotility and gastroesophageal reflux disease. J Gastrointest Surg. 2001;5:260-265. Campbell C, Levine MS, Rubesin SE, et al. Association between esophageal dysmotility and gastroesophaeal reflux on barium studies. Eur J Radiol. 2006;59:88-92. Ott DJ, Chen YM, Hewson EG, et al. Esophageal motility: assessment with synchronous video tape fluoroscopy and manometry. Radiology. 1989;173:419-422. Patti MG, Robinson T, Galvani C, et al. Total fundoplication is superior to partial fundoplication even when esophageal peristalsis is weak. J Am Coll Surg. 2004;198:863-869; discussion 9-70. Velanovich V, Mahatme A. Effects of manometrically discovered nonspecific motility disorders of the esophagus on the outcomes of antireflux surgery. J Gastrointest Surg. 2004;8:335-341. Luedtke P, Levine MS, Rubesin SE, et al. Radiologic diagnosis of benign esophageal strictures: a pattern approach. Radiographics. 2003;23:897-909. Ott DJ, Chen YM, Wu WC, Gelfand DW. Endoscopic sensitivity in the detection of esophageal strictures. J Clin Gastroenterol. 1985;7:121-125. Levine MS, Goldstein HM. 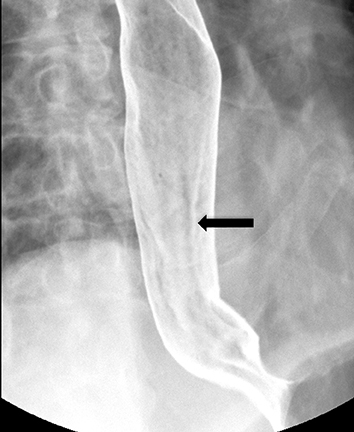 Fixed transverse folds in the esophagus: a sign of reflux esophagitis. AJR Am J Roentgenol. 1984;143:275-278. Levine MS, Moolten DN, Herlinger H, Laufer I. Esophageal intramural pseudodiverticulosis: a reevaluation. AJR Am J Roentgenol. 1986;147:1165-1170. Gordon AR, Levine MS, Redfern RO, et al. Cervical esophageal webs: association with gastroesophageal reflux. Abdom Imaging. 2001;26:574-577. Baker ME, Einstein DM, Herts BR, et al. Gastroesophageal reflux disease: integrating the barium esophagram before and after antireflux surgery. Radiology. 2007;243:329-339. Thompson JK, Koehler RE, Richter JE. Detection of gastroesophageal reflux: value of barium studies compared with 24-hr pH monitoring. AJR Am J Roentgenol. 1994;162:621-626. Ott DJ. Gastroesophageal reflux: what is the role of barium studies? AJR Am J Roentgenol. 1994;162:627-629. Skinner DB, Camp TF, Jr. Measurement of gastroesophagela reflux in the evaluation of hiatus hernia and chest pain in fliers. Aerosp Med. 1967;38:846-850. Evaluation of gastroesophageal reflux and its complications. Appl Radiol. Dr. Zarzour is a Assistant Professor in the Department of Radiology, Dr. Sanyal is an Associate Professor and the Witten-Stanley Endowed Chair of Radiology, and Dr. Canon is a Professor and the Chair of Radiology, at the University of Alabama at Birmingham, AL.